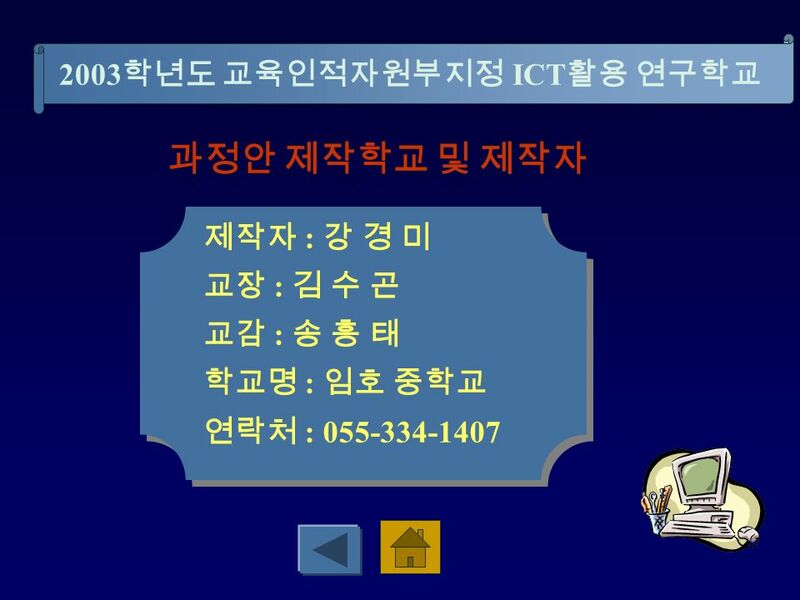 3 무엇을 공부할 지 알아봅시다. 1. 의사와 환자사이의 대화를 표현할 수 있다. 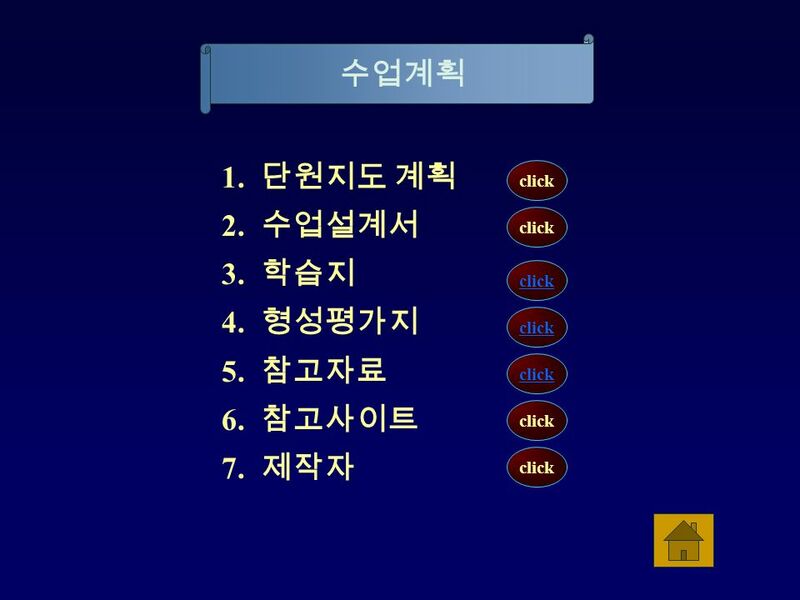 학습 안내 대기활동 1 활동 2 활동 3 정리평가학습목표 2. 생활 습관과 건강의 관계에 대해 이해할 수 있다 3. 자신의 생활 습관을 쓸 수 있다. 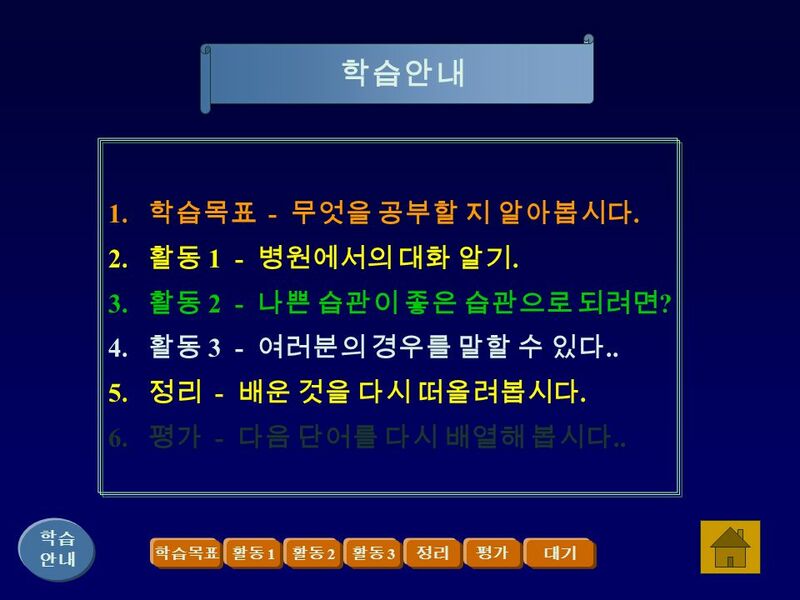 5 나쁜 습관이 좋은 습관으로 되려면 ? 학습 안내 학습목표활동 3 정리평가활동 2 대기활동 1 He doesn ’ t have breakfast. - He eats meals at regular times. *He usually has hamburgers & coke. 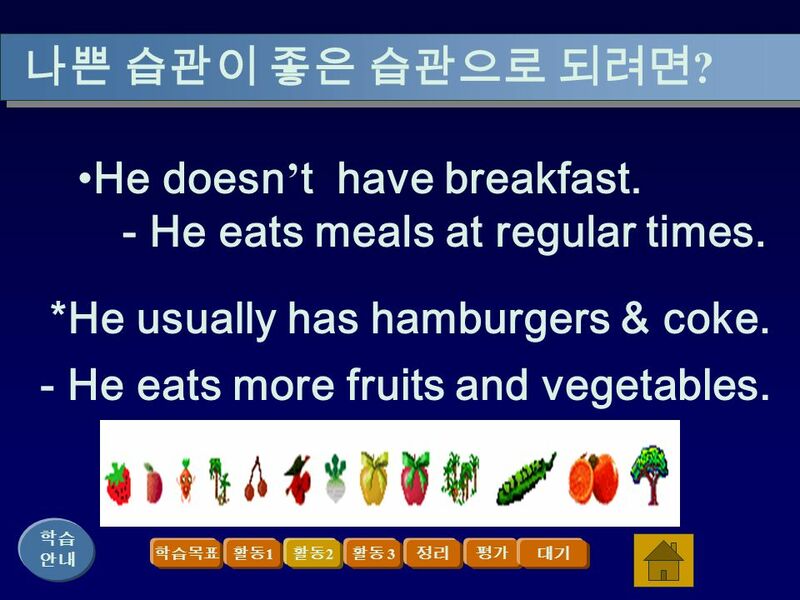 - He eats more fruits and vegetables. 6 여러분의 경우를 말할 수 있다. 학습 안내 학습목표활동 2 정리평가활동 3 대기활동 1 1.What healthy foods do you eat? 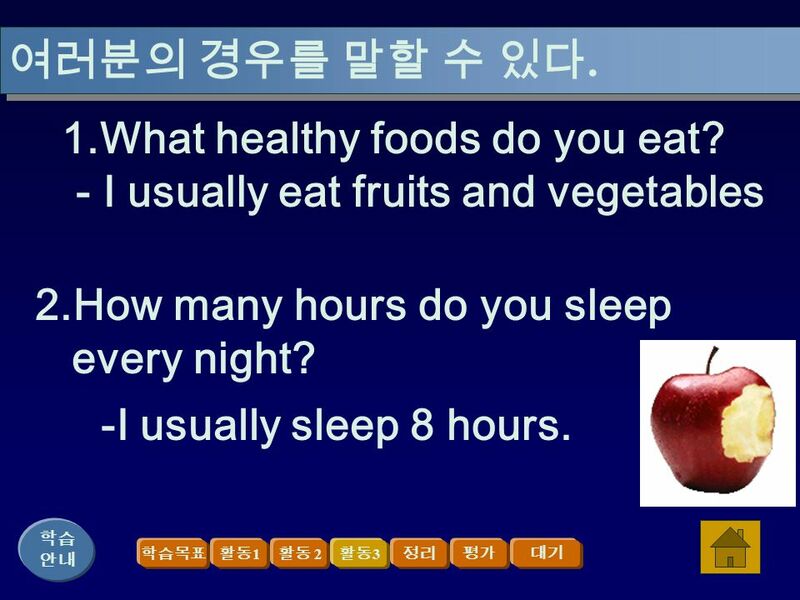 - I usually eat fruits and vegetables 2.How many hours do you sleep every night? -I usually sleep 8 hours. 7 배운 것을 다시 떠올려봅시다. 1.A : I have a stomachache. 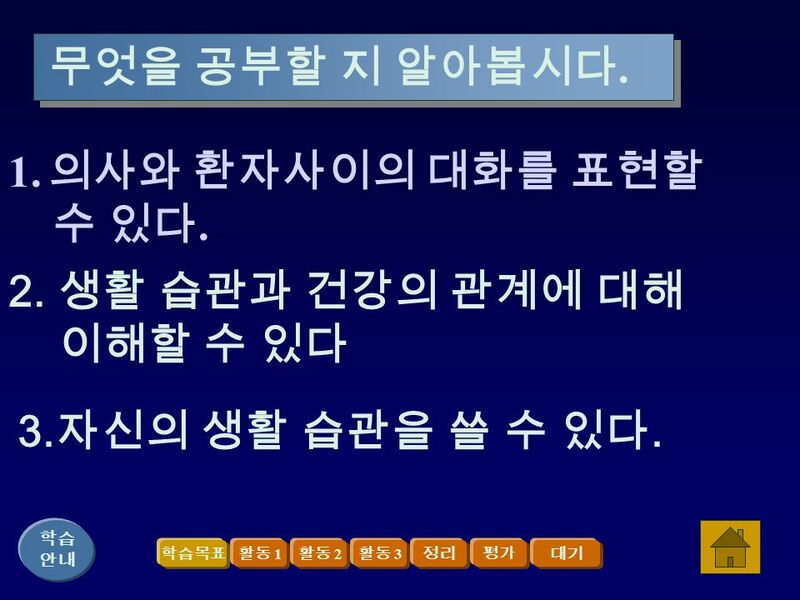 ( 마우스로 화면을 클릭해보세요.) 학습 안내 학습목표활동 1 활동 2 활동 3 평가정리대기 B: That’s too bad. What happened? A : I ate too much. 2.A : I have a pain in my ear. B: I’m sorry to hear that. 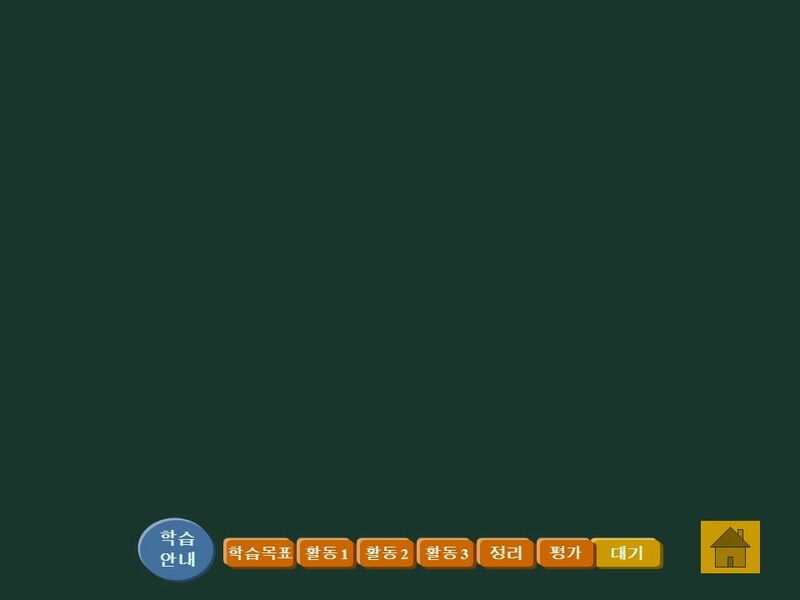 8 다음단어를 다시 배열해 봅시다. 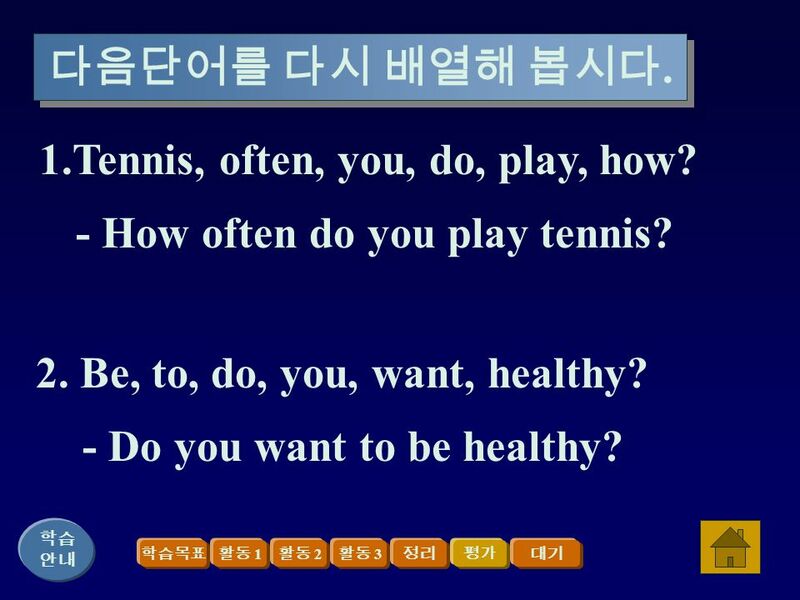 학습 안내 학습목표활동 1 활동 2 활동 3 정리평가대기 1.Tennis, often, you, do, play, how? - How often do you play tennis? 2. Be, to, do, you, want, healthy? - Do you want to be healthy? 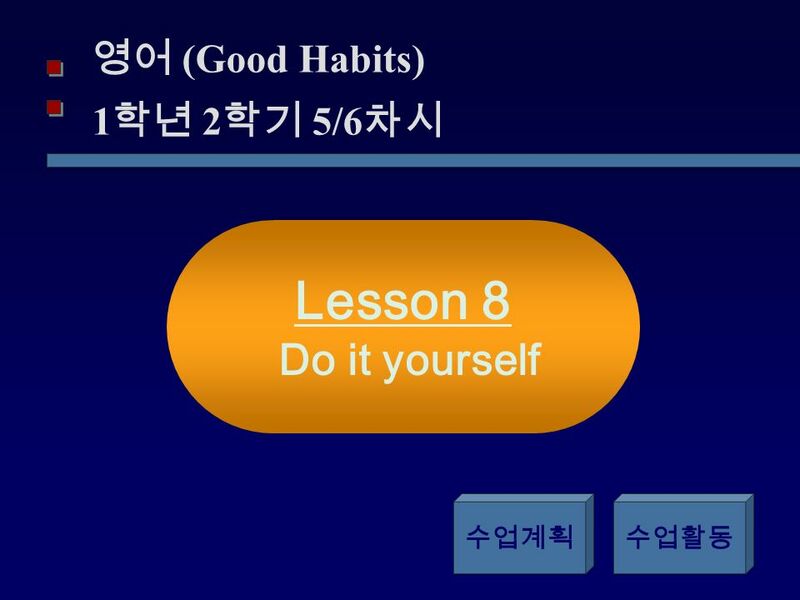 Download ppt "영어 (Good Habits) 1 학년 2 학기 5/6 차시 Lesson 8 Do it yourself 수업계획수업활동." Lesson 4 The Meanings of Colors Different Colors Have Different Meanings. Plan 1. 계획 I’m going shopping after school. This is my plan. 2. 계획하다. I’m planning a garage sale. I’m planning to go shopping. 명사 동사. Help your book choice Kim Seoyul Kim Jinho Kim Doyoung Go Sungmin. → to 부정사 : 「 to + 동사원형」의 형태 ( 명사, 형용사, 부사 역할 ) → 명사적 용법의 to 부정사 : ‘~ 하기, ~ 하는 것 ’ 의 의미로 문장 내에 서 주어, 보어, 목적어로 쓰인다. → 동사에 따른 사용 : to 부정사를 목적어로 취하는 동사, 동명사를. 정의 의문사가 있는 의문문이 다른 문장의 일부가 될 때 주어와 동 사의 위치가 바뀌게 되는데 이것을 간접의문문이라고 한다. 간접의문문 A Do you know what time it is? I don’t understand why they are angry. No one. 영어영문학과 강성문.  YES/NO Question formation -Are you happy? -----> Yes, I am./ No I’m not.  Wh- Question formation  Who is she? -----> She is Mary. Lesson 2 A Caring Friend. Making true friends is hard. Keeping them is even harder. To keep a good friendship, you need to care about others. Then, how. Occupations. police officer - 경찰관 nurse - 간호사 doctor - 의사.